Rainfall-derived Inflow and Infiltration (RDII) modeling can be complex. The RDII flow response in a sanitary sewer system can vary widely based on hydrologic conditions, methods of sewer construction, age of infrastructure, and a Utility’s long-term commitment towards maintaining aging sewers. This response can be learned with the assistance of flow metering and hydrologic and hydraulic (H&H) modeling. A well calibrated H&H model can be used to extrapolate to other hydrologic conditions (such as large storm events) and evaluate RDII removal effectiveness associated with sewer rehabilitation strategies. However, even when quality flow data is available, meters typically capture flow from relatively large catchment areas. As such, the metering and modeling can provide insight into how much RDII is being generated within a catchment, but does not always allow for quantification of site-specific RDII sources. And without a detailed understanding of where the RDII is coming from, sewer rehabilitation methods cannot always be chosen without additional field investigation and cost. But what if we could model specific sources of RDII, such as private property sources (e.g. foundation drains and house laterals), and cracks within specific sewer segments? If we could, what would it tell us? And how could this information be applied on a larger scale? This paper will describe an innovative micro-scale modeling effort that was used to evaluate discrete elements of a coupled sanitary / storm sewer system in pilot areas of the Heights Hilltop Interceptor (HHI) sewershed, to answer these very questions. Sewers systems within the HHI area are unique in that much of the sewershed contain coupled systems, where sanitary and storm sewers share the same trench. As a result, there is typically a hydrologic connection between the storm and the sanitary sewers. Some systems were built with divider walls (weirs) in each manhole, which allow flow to pass between the two systems (either way) when flow levels exceed the height of the wall. Other systems are under/over systems, where the sanitary sewers were constructed directly below the storm sewers. Access to the sanitary sewers is provided with a removable steel invert plate in each manhole. These invert plates are typically not water tight, and as such can provide a direct flow pathway from the storm sewer into the sanitary sewer below. 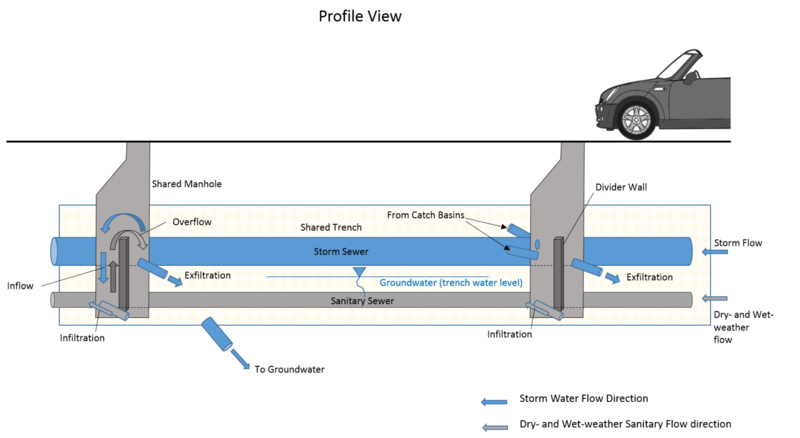 And if the sanitary system below becomes surcharged, flow pressure can lift the invert plates, creating a direct flow pathway from the sanitary sewer to the storm sewer. This micro-scale modeling was performed under authorization of the Northeast Ohio Regional Sewer District (NEORSD) using the modeling software PCSWMM. 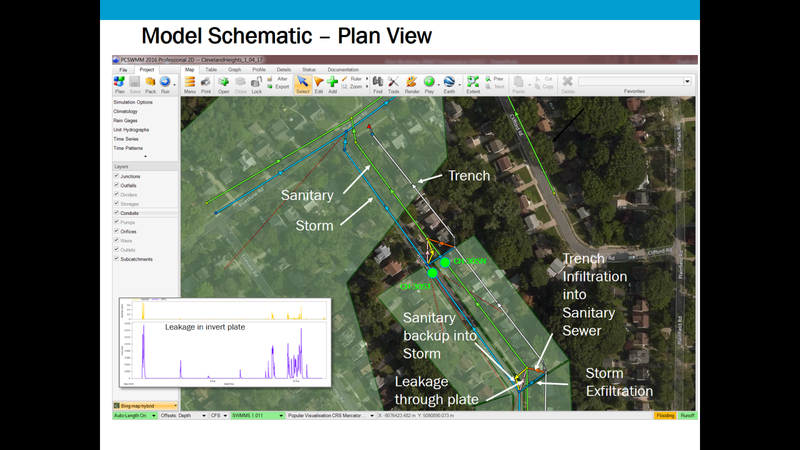 The model setup was unique for two reasons: 1) it required sufficient detail to simulate the RDII response on a micro-scale; and 2) it needed to account for the hydrologic connectivity of the coupled sanitary / storm sewer systems. The paper will describe the model setup, calibration, and application of the coupled modeling and how it is being used to positively impact regional water quality and public health in Cleveland’s surrounding communities. Model schematic showing the elements of the coupled model with divider wall. Model setup showing modeled elements in a coupled storm / sanitary system with invert plates. The green dots are flow meter locations on the storm and sanitary sewers.